What if the United States and Canada bore three times as much oil as Saudi Arabia? Add that to the vast amounts of U.S. natural gas and coal reserves we know we have. Now, what if the globalist, central bankster controllers and their tycoons and barons have known this and have intended to horde energy here, as they horde gold, for the sake of their own mega-wealth and mega-power? Suppose they wish to keep our energy resources in reserve, so with low supply meeting high demand, they may profiteer in the present, while their surreptitious work of stealing American resources and making a colony of America itself, proceeds to its future outcome. This is being done as we speak, via U.N. Agenda 21, its connection to triple bottom line banking and lending, White House Executive Orders, EPA regulations, and by other means. That is a thesis which is becoming widely discussed among independent Internet journalists and researchers. Among them is William Kay, whom we interviewed not long ago. He spelled it out, then (see “Gulag Night: Eco-Fascism in America; Guests: William Kay & Mark Musser“). More on this, soon. But, so far, no prominent American politician has hit this subject matter on the head, though Ron Paul has nipped at it. Now, Newt Gingrich discusses the real research data on American energy reserves and the ability for the United States to not only be energy independent but to become an energy exporter, as well. A former Speaker of the House should know this stuff, now shouldn’t he? 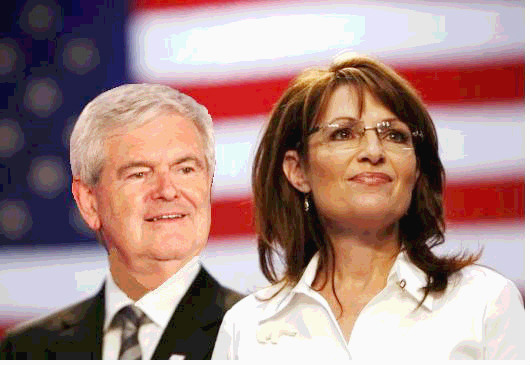 Especially if that person is the student of the world of the past, present, and future, that Gingrich is. He explains in this video, posted just a few days ago. Now, are we coming to understand why the bankster-globalist-tainted elitists of both the Republican and Democratic Parties, plus the Rockefellerized, Marxstream media, who do as they are indoctrinated, as they are told, and as they are controlled, hate the likes of Newt Gingrich and Sarah Palin? Let us pray for those two. And let us defend and support them, ourselves. William Kay has a new book review which does reveal the money trail of the environmental movement. Many corporations are all involved in the green movement – http://ecofascism.com/review28.html.